Floating Point performance - Sizing Up Servers: Intel's Skylake-SP Xeon versus AMD's EPYC 7000 - The Server CPU Battle of the Decade? Normally our HPC benchmarking is centered around OpenFoam, a CFD software we have used for a number of articles over the years. However, since we moved to Ubuntu 16.04, we could not get it to work anymore. So we decided to change our floating point intensive benchmark for now. For our latest article, we're testing with C-ray, POV-Ray, and NAMD. C-ray is an extremely simple ray-tracer which is not representative of any real world raytracing application. In fact, it is essentially a floating point benchmark that runs out of the L1-cache. Luckily it is not as synthetic and meaningless as Whetstone, as you can actually use the software to do simple raytracing. We use the standard benchmarking resolution (3840x2160) and the "sphfract" file to measure performance. The binary was precompiled. Wow. What just happened? 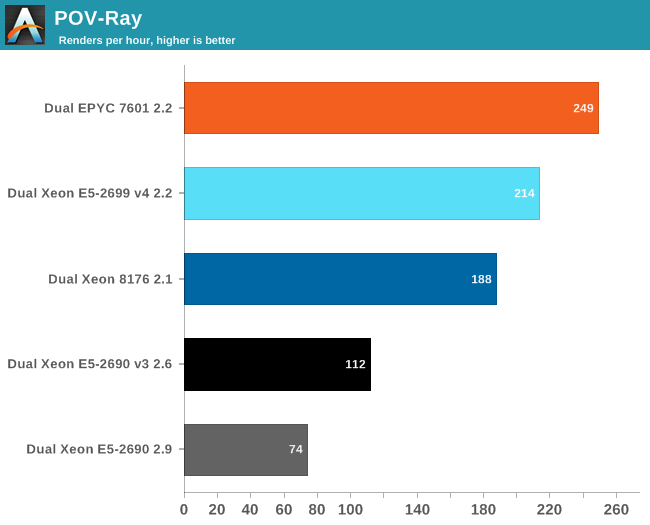 It looks like a landslide victory for the raw power of the four FP pipes of Zen: the EPYC chip is no less than 50% faster than the competition. Of course, it is easy to feed FP units if everything resides in the L1. Next stop, POV-Ray. The Persistence of Vision Raytracer (POV-Ray) is a well known open source raytracer. We compiled our version based upon the version that can be found on github (https://github.com/POV-Ray/povray.git). No special optimizations were done, we used "prebuild.sh", configure, make, and make install. POV-Ray is known to run mostly out of the L2-cache, so the massive DRAM bandwidth of the EPYC CPU does not play a role here. Nevertheless, the EPYC CPU performance is pretty stunning: about 16% faster than Intel's Xeon 8176. But what if AVX and DRAM access come in to play? Let us check out NAMD. Developed by the Theoretical and Computational Biophysics Group at the University of Illinois Urbana-Champaign, NAMD is a set of parallel molecular dynamics codes for extreme parallelization on thousands of cores. NAMD is also part of SPEC CPU2006 FP. 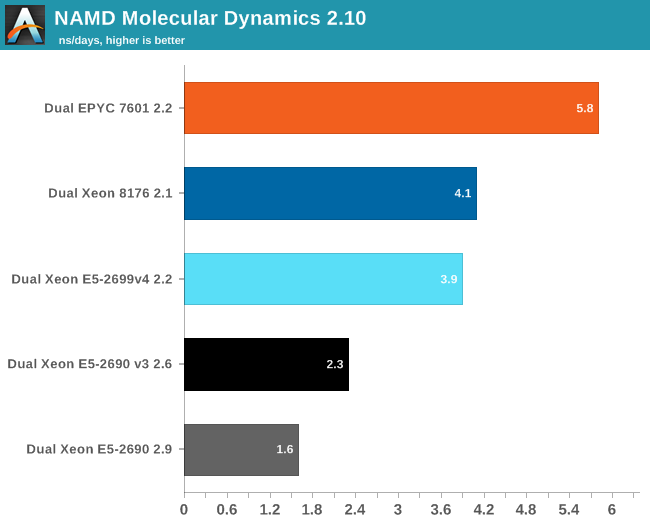 In contrast with previous FP benchmarks, the NAMD binary is compiled with Intel ICC and optimized for AVX. First, we used the "NAMD_2.10_Linux-x86_64-multicore" binary. We used the most popular benchmark load, apoa1 (Apolipoprotein A1). The results are expressed in simulated nanoseconds per wall-clock day. We measure at 500 steps. 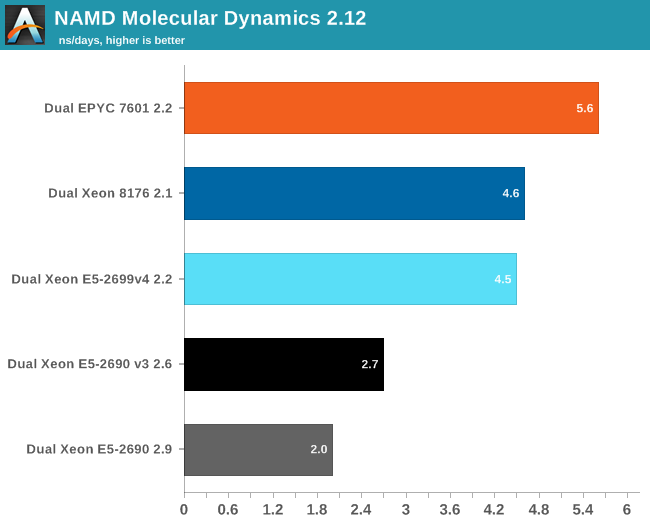 Again, the EPYC 7601 simply crushes the competition with 41% better performance than Intel's 28-core. Heavily vectorized code (like Linpack) might run much faster on Intel, but other FP code seems to run faster on AMD's newest FPU. 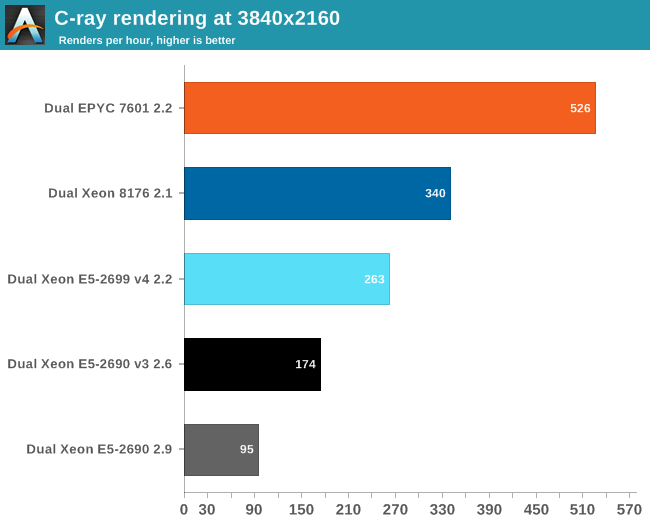 The older Xeons see a perforance boost of about 25%. The improvement on the new Xeons is a lot lower: about 13-15%. Remarkable is that the new binary is slower on the EPYC 7601: about 4%. That simply begs for more investigation: but the deadline was too close. Nevertheless, three different FP tests all point in the same direction: the Zen FP unit might not have the highest "peak FLOPs" in theory, there is lots of FP code out there that runs best on EPYC.